The week starts with a bang this very afternoon, Tuesday 27, with the opening of a multimedia exhibition, Finding the Lost Art Forms, at the Cambodian Living Arts gallery, (128-G9 Sothearos Blvd, marking the completion of a year-long CLA project to research and archive the most endangered forms of Cambodian music. 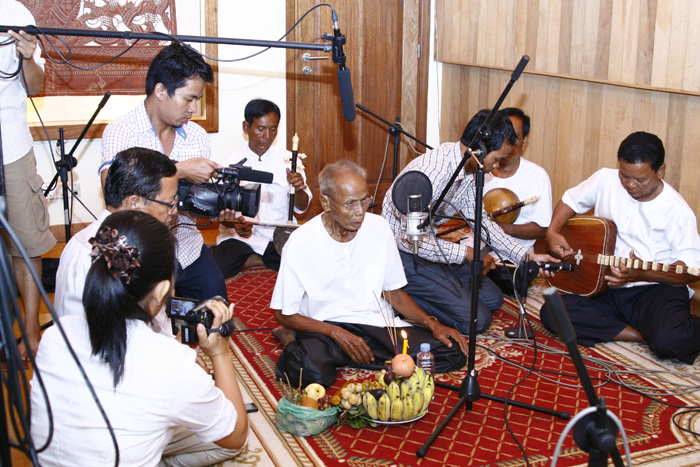 The project includes CD releases of Smot poetry chanting, Angkorian era wedding music, Areak music for spirit possession ceremonies, and traditional funeral music, complemented by three documentaries exploring these arts. The exhibition includes information about how the project unfolded, the surprises and discoveries. The documentaries will be screened this afternoon from 2 pm, with an official opening at 6 pm, followed at 6.40 pm by a 20 minute performance of classical wedding music. The documentaries will continue to be screened through the life of the exhibition, which runs until October 18. Friday evening from 5.30 pm, Sa Sa Art Projects presents A Child’s Eye View, put together by Children of the White Building, Sothearos Blvd, in collaboration with Aziza School, and Sa Sa Art Project’s artist-in-residence Emma Ota, as part of Sa Sa Art Project’s Pisaot Experimental Arts Residency programme. The children have used animation, photography and mapping to give an inside view of life inside this iconic example of post-colonial architecture. The event, which will be held in the Sa Sa Art Project space in the White Building itself will include a brief presentation by the participants, a screening of their moving image work, and the distribution of a unique map produced by the children themselves. This weekend Bophana Centre is continuing its screenings of Rithy Panh’s The Missing Picture, Friday to Sunday, at 6 pm. The Saturday screening is preceded at 4 pm by his 2003 film The People of Angkor. Also at Bophana, check out their current exhibition, Cambodian Forgotten Songs, marking a new CD production that has trawled through old music scores to arrange, rehearse, perform and record eight songs to recreate several genres of Cambodian music. The exhibition of photographs documents the whole process. The official launch of the CD will be on the last day of the exhibition, on Friday 13 September. On Saturday 31, from 6 pm, for those that cannot get enough of the Golden Era, Meta House hosts a photographic exhibition by Amazing Cambodia, a Facebook page, that features a massive collection of historical images. Looks stunning. Check last week’s 7 Days for background. On Saturday 31, in Siem Reap, the McDermott Gallery Old Market launches a new exhibition, Queen for a Night, works by Kampot-based artist Vincent Broustet. The theme of the paintings is the transformation that young Khmer women make from their everyday selves as they prepare for weddings and other significant occasions. 6 pm start. The show runs until October 31. Make yours a creative week, support an artist near you! Tell your friends about Kumnooh, like us on Facebook, send us things we don’t seem to know. And for rock and roll and clubs, make sure you follow LengPleng.com as well. Tuesday 27: Finding the Lost Art Forms, at Cambodian Living Arts gallery, (128-G9 Sothearos Blvd), from 2 pm (first documentary screenings), official launch from 6 pm, performance at 6.40 pm. Runs until October 18. More infoWhere I Go, by young Khmer filmmaker Neang Kavich, screening at Platinum Cineplex on Wednesday 28 at 6.30 pm. Friday 30 from 5.30 pm, Sa Sa Art Projects presents A Child’s Eye View, put together by Children of the White Building, Sothearos Blvd. Friday 30 to Sunday 1, Rithy Panh’s The Missing Picture, at 6 pm. Bophana Centre (St 200, between Monivong and 63). Amazing Cambodia Golden Era photo exhibition opens 6 pm, Saturday 31, at Meta House. Queen for a Night, works by Kampot-based artist Vincent Broustet opens Saturday night at 6 pm, McDermott Gallery Old Market in Siem Reap. The show runs until October 31. Cambodian Forgotten Songs, cataloguing the production of a new CD release of music recovered from old scores. Bophana Centre. The official launch of the CD will be on the last day of the exhibition, on Friday 13 September.